Rachel Bailey is grateful to be alive after sustaining an internal decapitation during a car crash. 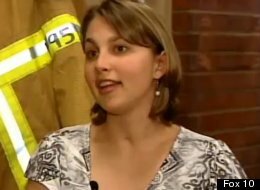 The 23-year-old from Phoenix, Ariz., told azfamily.com that she credits firefighters with saving her life. Bailey was pulling out of a side street when she was hit by a full-size pickup. The accident left her skull detached internally from her spine, an occurrence that typically results in instant death, reports the Daily Mail. But against all odds, and after a 5-week stint in intensive care that she has no memory of, Bailey has recovered her speech and motor function. This Monday, she had dinner with the firefighters who saved her. The firefighters were thankful, too, telling the station they appreciated seeing a positive outcome when they’re used to intervening in only the worst moments. According to Fox10, Bailey also met the Good Samaritan who helped hold her head before firefighters arrived.